As I mentioned yesterday, Canadian Thanksgiving will soon be upon us. And by us I mean mainly me since most of my readers are American. I thought I had better take some dishes for a trial run before I make them for members of my family next weekend, like this roast. I will warn you now that the stuffing is a tad finicky. I think when I make it next week I will add in a slice of bread or so to make it all stick together. I also discovered that I made the chestnuts pieces way too big--small is the way to go with stuffing. 1. Roast chestnuts and cook rice according to the directions (usually 1/2 cup of wild rice is cooked in 2 cups of water for 50-60 mins. Drain off any excess water). 3. 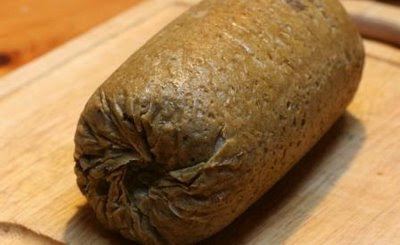 While stuffing is cooling, make seitan. Your stuffing needs to be cool or it will make your seitan break apart during rolling. 3. Put stuffing in a line the center of the dough. Compress the stuffing in your hands so the center of the roast will be firm. Gently but firmly roll the seitan with the stuffing in the middle (i.e. 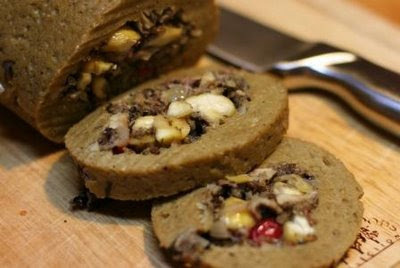 make sure there is a cavity in the middle with the stuffing in it--don't roll it like a jelly roll). Seal the ends and seam as best you can. 4. Transfer the roll to a piece of extra wide, extra strength aluminum foil (it is important to have this), and tightly roll up like a Tootsie Roll. 5. Steam for 30 mins, turning over after 15 mins. While steaming, preheat oven to 350 degrees. Then, place roast in a loaf pan and bake for 25 mins. 6. Let roast stand for 15 mins before unwrapping and slicing with a very sharp knife. Serve with your favourite gravy. The roast, unwrapped, after coming out of the oven.